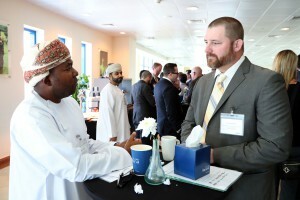 In 2017, the PESA International Outposts Committee identified the Middle East as a targeted region to host an event where members could address region-specific issues through an influential industry group, engage in best-practice sharing within anti-trust compliance and receive region-specific industry intelligence. The PESA Middle East Regional District Meeting was held at the Schlumberger Middle East and Asia Learning Centre in Abu Dhabi on November 14 during the Abu Dhabi International Petroleum Exhibition and Conference (ADIPEC) with keynote speakers including U.S. Ambassador to Iraq Douglas Silliman, Deputy Chief of Mission in UAE Steve Bondy and Zahir Al-Wahaibi, Strategic Finance Manager, Petroleum Development Oman (PDO). The success of the event and the feedback from members resulted in the development of the PESA Middle East and North Africa (MENA) Chapter. The Chapter was created to align the regions energy industry’s service, supply and manufacturing organizations with local regulatory requirements and business landscape in the Middle East and North Africa. The chapter will promote international best practices and world-class industry standards with local governmental organizations to advance member priorities on key industry issues, while working and understanding local regional regulatory framework and energy policy. Steve Abbiss, General Manager, Middle East, TechnipFMC: Health & Safety. The Middle East Regional Chapter will also host biannual events which will be open to all Members as an opportunity to network and share best practices and general industry information. The biannual meetings will have several keynote speakers and provide the opportunity for Members to interact with experts in chosen topics. PESA plans to host an event during ADIPEC again this November. If you are interested in joining the MENA Steering Committee or any of the subcommittees, please contact Molly Determan, VP Communications & Member Relations.